Home / Light up your life – letters and numbers for any occasion! 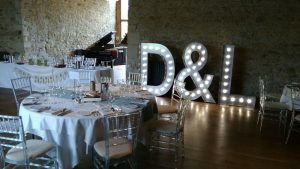 and this one at the equally stunning Plaisterer’s Hall, in London……..
And ‘Wedding Letter Hire’ is not just for weddings! We’ve also been helping you spell out your names in lights! 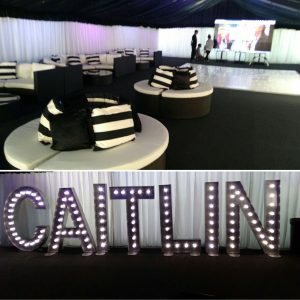 We spelt out ‘Caitlin’ for a very special teenager’s party and we think the letter lights look even better alongside these super cool ‘Bulgari’ sofas with monochrome scatter cushions, hired from our sister company Rio Lounge – the black and white theme looked so striking! 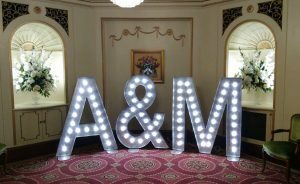 Don’t forget we also have numbers as well as as letters, so whether you’re celebrating 16, 60, 100 or anything inbetween – some gorgeous aluminium light up numbers may be just what you need for that special sparkling party centrepiece.